Anyone have any experience with the Vitus kids bikes, specifically the Vitus 16? I have a soon-to-be 4 year old who is 41" tall. 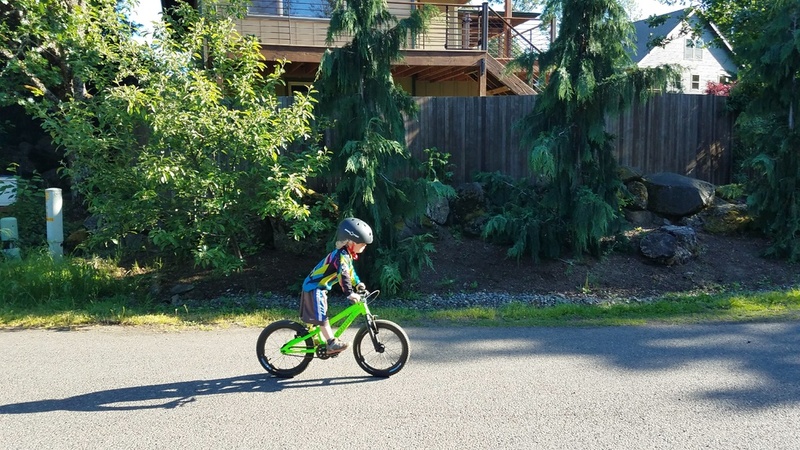 He has fun on a strider balance bike, looking for a first pedal bike. I'm split between the Vitus 16 on CRC (LINK) for $238 or an older model Priority 16 belt drive that's used for $150, but a 2 hour drive to pick up. 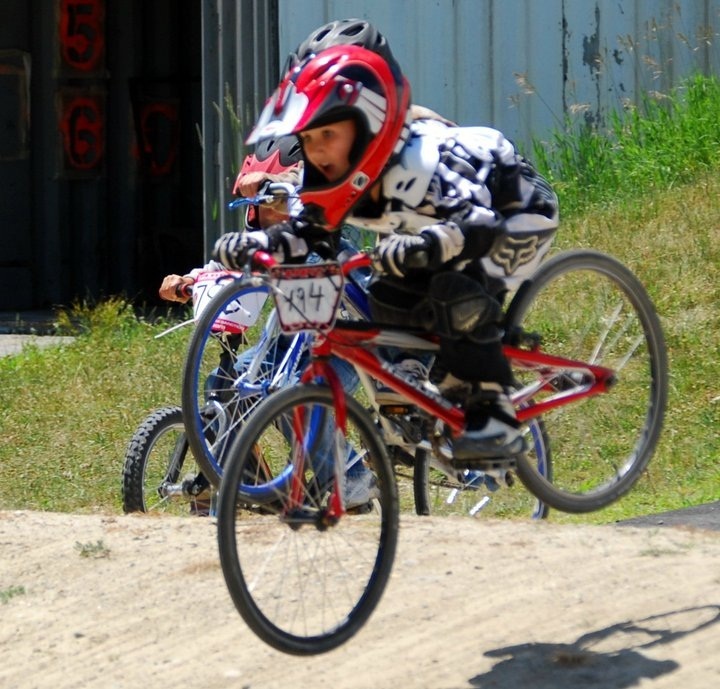 I think a good goal at this age is to have a ton of fun and also develop critical bike skills that make biking fun. Vitus is killing it in the value department but that is just a little roadie bike meant for sitting and pedaling on pavement with razor thin tires. I'd pass on that and pick up a Kink Roaster BMX 12" for 200$ (maybe a sale too?). BMX sizing is smaller fyi. A BMX is the best skill development bike you can find usually. Spawn Yoji is awesome too as it's similar and has a DJ design. It'll be more money but also more versatile with its meaty tires on wide rims and 13lb weight. Lots of great stuff in that bike. 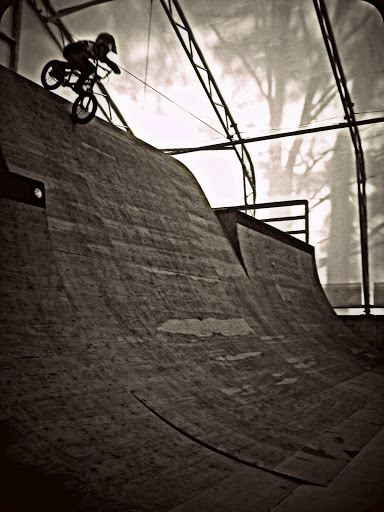 A true BMX is awesome too. 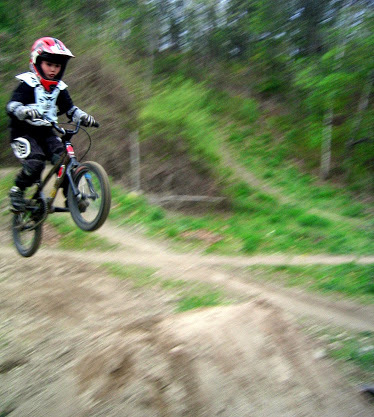 When we were kids, we just got a bmx, pedaled and learned to stand and jam for everything. These new little neighborhood pedal bikes aren't doing much for kids development beyond just sit and pedal and that's just not fun biking. Just my opinion, but it def has worked for us and a few others. My 7yro is a solid rider on black diamonds (no phenom tho) and my 4yro is jumping and doing a little downhill. Part of that is the right tools for the job. For a legit MTB Prevelo makes a sick 16 rigid with a 66hta and disk brakes with nasty tires. A buddy has one. It's not perfect for everything but for mellow downhill trails it's great. Disk brakes are so critical for young riders going down. Don't underestimate the amount of confidence that comes from being able to plant a foot down if things start to get shaky. Minimum seat height is one big feature on the Spawn bikes that could make a big difference for a first pedal bike. The lower heights are a 50/50 combination between frame design and using Pivotal rather than railed seatposts. You can get halfway there by buying a Pivotal seatpost & saddle or a BMX integrated seatpost / saddle, but that puts you a lot closer to the price of the Yoji. Spawn Yoji 16 - 16"
Prevelo Zulu Two / Zulu Two Heir - 18"
Priority Start 16 - 18.5"
At 19", you're pretty close to the saddle height for a 20" Spawn Yama Jama. You will not be disappointed with the Spawn Yoji. It's just not comparable. The 20" and 24" Vitus are killing is. But for the 16" bike, I would go with the Yoji. 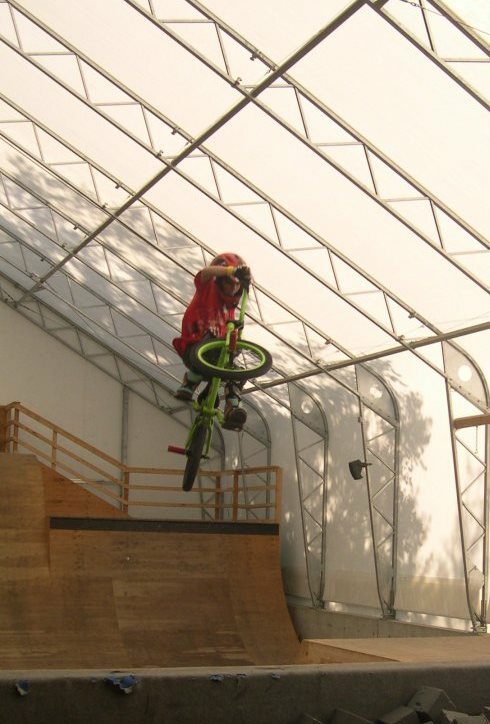 You can go ride trail, pump track, BMX park. Literally anything. How did you all handle the transition from balance to pedal bike? I think training wheels are terrible so hoping to avoid them with a decent bike. If you get a bike that isn't too big, and they can really cruise on the balance bike already, it'll take the kid about 10mins to an hr to pedal well enough. If you start on a smooth surface with a very slight decline (we did pavement) it's just easy. If you want you can just leave the pedals off and have them get comfy riding it like a balance bike, but even that will be silly after 10mins. They'll pick it up quick due to the balance bike magic. Training wheels are awful for sure. 3- Strider brand kids pads - these are awesome and actually fit too. 4- At some point you'll want a Full Face helmet, no joke. Kids crash and can hit their face on stuff pretty easily. A discount Bell Super 2/3r in size small fits their little heads well enough AND they can wear it for the next 4 yrs due to the ratchet. You'll need one, might as well get it early. I didn't, and my 3yr smashed his face on a 1mph crash and nearly killed a tooth (its still a little brown). It seems silly now but its really not. The pads and stuff are really critical early on as well, especially for kids who aren't as confident. It only takes one crash to scare them if they get hurt a lot. When they are this young, they crash all the time so the pads protect their confidence as much as their hands and knees. Oh, and never raise the seat! Stand and jam only. 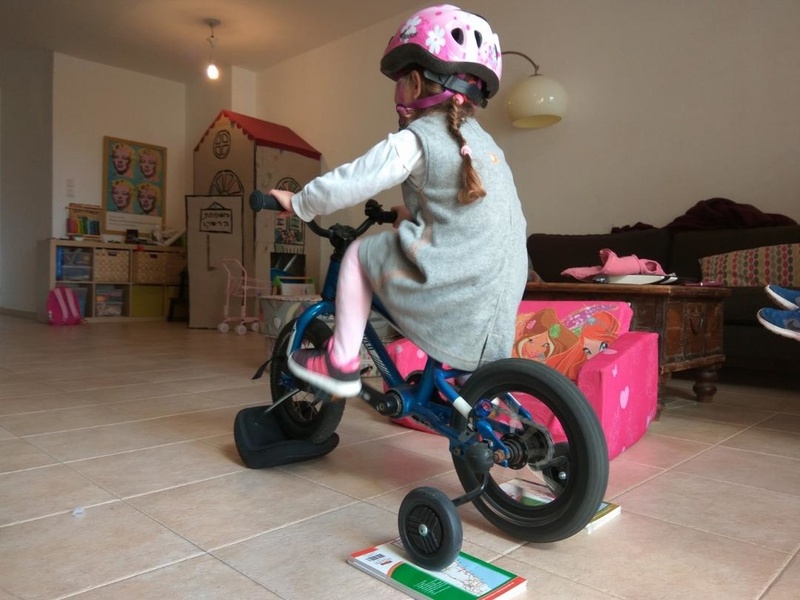 (Stand and pedal is the second thing to teach after they can sit and pedal...you want that to be "homebase" for them. Good to get out of it early and they'll have 10x more fun. Should take a few months. 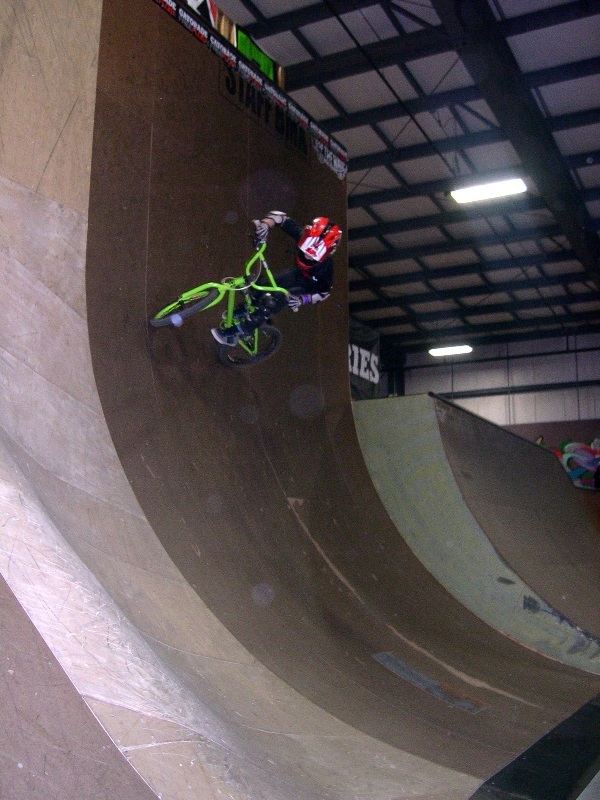 My 3yro a few weeks before he crashed on Yoji 16"
It took my 2 year old about 10 mins to transition. She still rides her strider a bunch but she loves to rider her "big girl bike" quite a bit. We slam the seat on the Yoji for my 5 year old. My experience is it takes more energy to get them to stand as sitting is "easier." Anyone have any experience with the Vitus kids bikes, specifically the Vitus 16? I have a soon-to-be 4 year old who is 41" tall. At 41", the 16" will probably be too high and long for at least half a year, if not more. If you have another kid in line, go for the 14". If not, well, do what you think is best. As for the bike: it is light, has descent V-brakes with short-reach levers (very important), and everything seem to be made of fair quality. It's not high end stuff, but reliable, and won't rust after a month. The bike is equipped with road-only tires. As you can see above, I converted it to off-road, using Spawn 14" tires. I had to replace the brakes - the arms were too short to clear the fat tires. The bike came with a really long gear, which is probably OK for a 6 YO , living somewhere flat. I used a spare Spawn crankset I had, and shortened the gear a little. In the Vitus package you also get a real multi-tool, a 15mm spanner for the wheels, and a tiny bottle of the original paint, for fixing scratches! That's a very nice touch, but I cover my kids bikes with 3M Heli-tape, so the frames almost never get scratched. 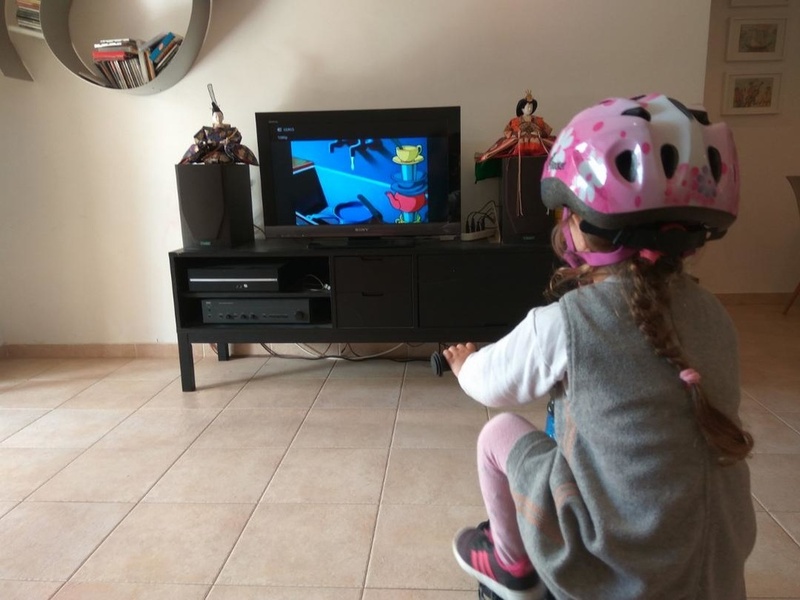 Whenever she stopped pedaling - I paused the cartoon . . .
We did this for about 40min. Then we went down to the park, took off the stupid training wheels, and never saw them since. If they start "riding" with the awful "training wheels", they quickly develop fear of riding a true bike. My son started on them. 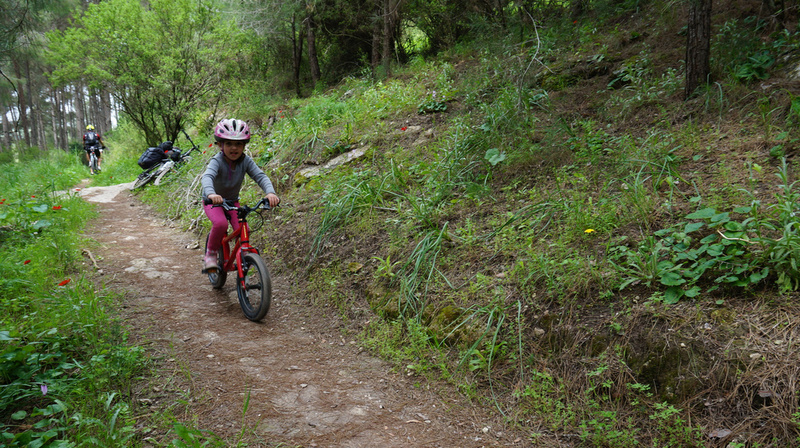 I've seen many kids handle balance bikes well, than move to training-wheeled bikes and getting stuck there until they're 7 or 8. 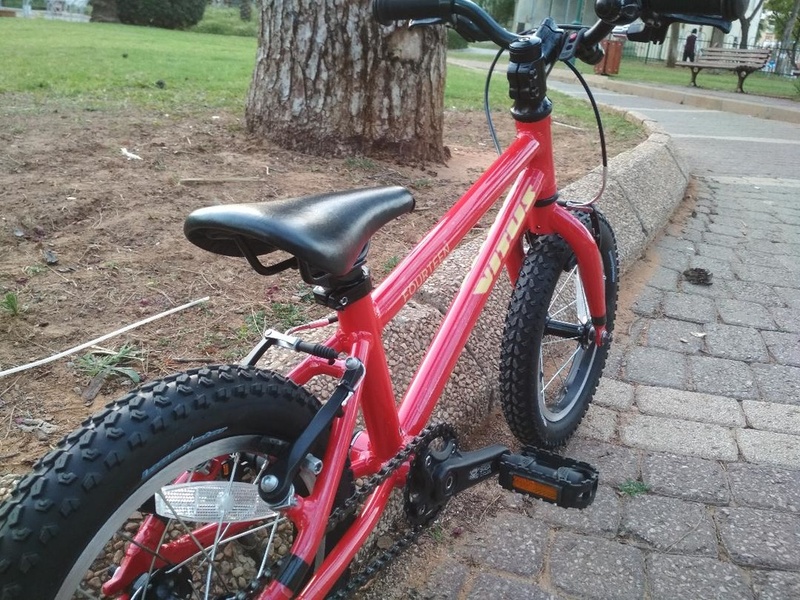 Kids who knew perfectly well to control a two-wheeled vehicle, are sluggishly pushing a heavy 18" "bike" 500m on the park, afterwards the parent has to carry it for them. It's not always the case, but the risk is big enough to consider. We obviously inhabit very different worlds if you see a lot of 7 and 8 year old kids on training wheels. Maybe they should have been on them 5 years earlier and they'd be riding by now. I'm curious though, if scoot-bikes are supposedly the be-all and end-all for teaching kids how to ride a real bike, why would they ever move from scooting to training wheels in the first place? And then it takes them years to figure out how to pedal? Are there any physical or mental developmental disabilities involved? You can't go strictly blaming training wheels for that sort of lag. Sluggishly pushing his 30+lb 18" bike around the park..
Getting a 3 year old and 6 year old to school?